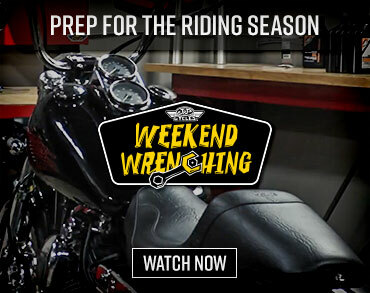 Climb on and take a spin on the 2014 Chief Vintage as we pit it against its rival from Harley-Davidson, the 2014 Heritage Softail Classic. The 2014 Harley Heritage Softail Classic is one classy ride. Here how it fared against its competitor from the Indian Motorcycle Co. in our 2014 Harley Heritage Softail Classic Comparison video. They’re the most storied motorcycle manufacturers in American biker lore. Both scratched to life in the early 1900s, developed motorcycles that quickly earned reputations and fostered brand allegiances that ran deep. The companies grew by carving their names into motorcycle racing history books, from the Salt Flats in Utah to as far away as the Isle of Man. They bred Wrecking Crews and spawned Jackpine Gypsies, waged battles on board tracks, hill climbs, and the beaches of Daytona. They’ve championed Emde’s and Munro’s, Petrali’s and Parker’s while instigating countless rivalries. Harley-Davidson and Indian Motorcycle Company have been nemesis for a long time. But disparate fortunes caused the rivalry to wane. Indian Motorcycles has risen and fallen with the tide as its golden years passed and production ceased in 1953. Several attempts to resurrect the brand failed as it toiled through the Gilroy era before a British private equity firm did its best to again relaunch the company with high dollar motorcycles built in Kings Mountain. Now it has landed in the hands of a very able partner for the first time in many years, parent company Polaris with a multi-billion dollar portfolio. That portfolio includes Victory Motorcycles, which helped Polaris trim Harley’s sales, but admittedly it lacked a company with an iconic American image and long-standing heritage. And so it bought Indian, and finally the company that has seen its share of turbulent times is in the possession of an entity with the talent and resources to once again make it competitive. On Saturday, August 3, in front of a packed house on Main Street in Sturgis, Polaris rolled out the first three Indian Motorcycles it had produced, among them the traditional-styled 2014 Indian Chief Vintage. The 1690cc Twin Cam 103B of the 2014 Harley Heritage Softail Classic put out 82.26 lb-ft of torque @ 3200 rpm and 66.33 hp @ 5200 rpm. The 1811cc Thunder Stroke 111 V-Twin of the 2014 Indian Chief Vintage turned our dyno to the tune of 100.87 lb-ft torque @ 2700 rpm and 73.33 hp @ 4500 rpm. Depression, the Recessions, and what is known as the AMF years. It has done so by staying true to itself, true to producing what it knows best, and it’s ability to transcend beyond simply sales and into a lifestyle is a recipe everybody’s eager to steal. On Monday, August 19, Harley’s introduction of its Twin-Cooled engine, Project Rushmore and a restyled Batwing fairing stole the headlines at the introduction of the 2014 models. But there was a long list of Sportsters, Dyna and Softails released for 2014 too, including a timeless American cruiser, the 2014 Heritage Softail Classic. Hoping to stoke the flames of a rivalry that stretches over 100 years, we pit the 2014 Indian Chief Vintage against the 2014 Harley Heritage Softail Classic. Externally, the two are carbon copies of one another, big classic-cued cruisers clad in chrome, swooping fenders and softail-style suspension, chrome auxiliary lights and tall windscreens, cush leather seats and classic leather saddlebags. The tell of the tape shows both are powered by big pushrod-driven V-Twins, the Harley Heritage running a 1690cc Twin Cam 103B while the Indian’s propulsion is provided by the 1811cc Thunder Stroke 111. Both have six-speed transmissions fed by electronic fuel injection, each has ABS and hidden rear suspension. Dunlop is the tire of choice for both cruisers, whitewalls in the case of the bikes we tested, wrapped around shiny spoked wheels. Overall the long list of similarities is undeniable. So Motorcycle USA test rider Justin Dawes and I set about testing the two under real-world conditions, from the clogged arteries of LA’s 405 freeway to cruising the PCH, doing dashes over Ortega Highway and inland to secret photo stops. We lived in their saddles for a week, from stop-and-go stints to light touring, and the 2014 Harley Heritage Softail Classic won the efficiency award with an average of 35.514 mpg, a bit better than the guzzling 33.99 mpg average of the 2014 Indian Chief Vintage. Given the Indian has a 0.5-gallon larger tank than the Harley, projected range is almost identical with the Harley good for approximately 177 miles before a fill up while the Indian should be able to stretch it out to around 186 miles. Peeking at the spec sheet, the ’14 Chief Vintage has an MSRP of $20,999 while the ’14 Heritage Softail Classic with the Morocco Gold Paint and wheel package as tested is priced at $19,259. And while we believed the two would perform almost identically based on their similarities, we couldn’t have been more wrong. They offer much different riding experiences, from the output of their engines to the way they handle and steer. One stretches riders out and feels long and low while the other is tight and compact. From turn-in to braking, there are notable differences between the two. Read on as the 100-year-war reignites, Harley versus Indian, Heritage versus Vintage.